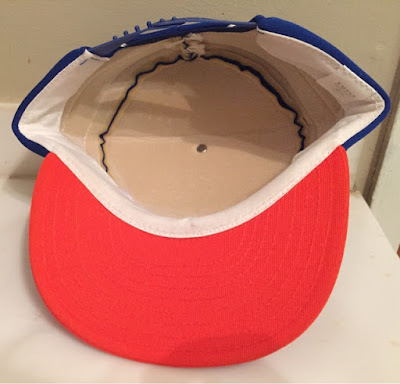 If you are reading this post then you are probably some sort of a baseball nerd which means you know that the last time the New York Mets won the World Series was in 1986. 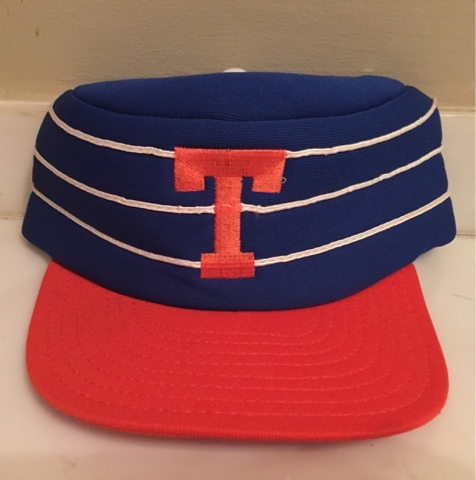 If so, then it's also likely that you recognize this week's featured cap as one the Tidewater Tides wore in the early 1980's when they were the Mets' AAA affiliate. 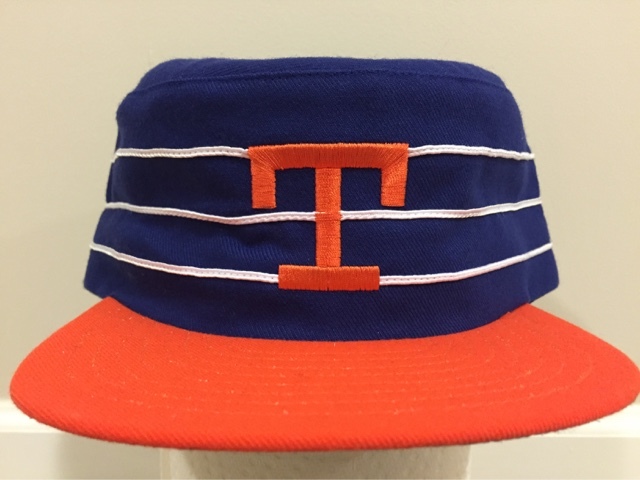 This is the most iconic Tidewater Tides cap of all time. 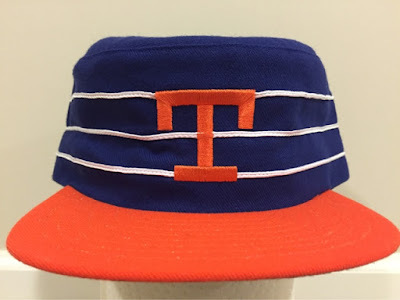 Clearly the "T" here is more stout than every other Tides cap you will see from this period. Holy Orange! It's held up great after 30 years in storage. Thank you Polyester! 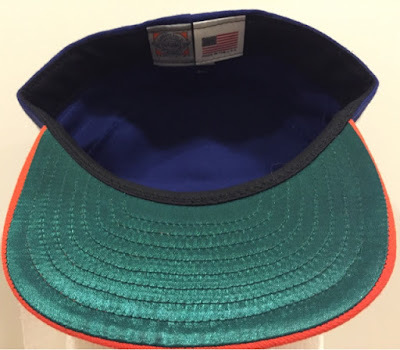 Negative points for the flimsy foam construction on this snapback but it captures the spirit of the era perfectly! This is what the "T" should look like on the pillbox Tides caps. 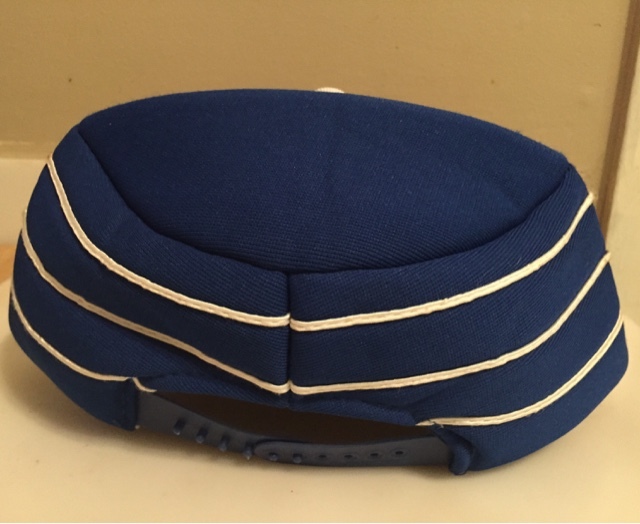 As per usual, EFF implemented a satin green undervisor on this one. 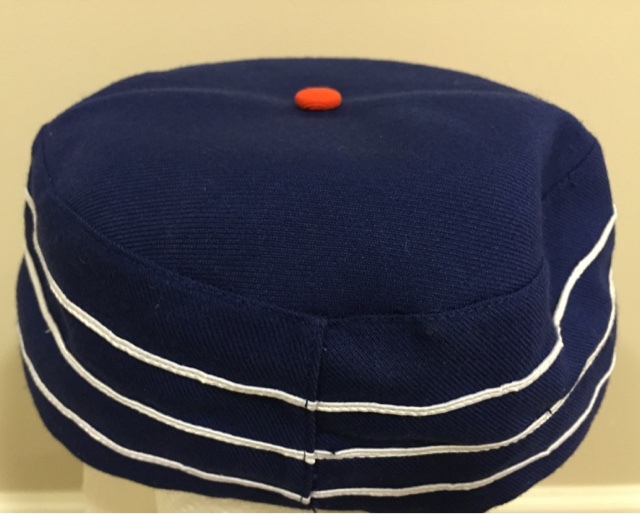 Another way this one varies from the one above is that this is a fitted cap thus making it eligible to be this week's Fresh Fitted! Also, that orange button really pops out doesn't it? A good number of the players on that 1986 World Series team wore this pillbox style cap while making their way up through the Mets minor league system. 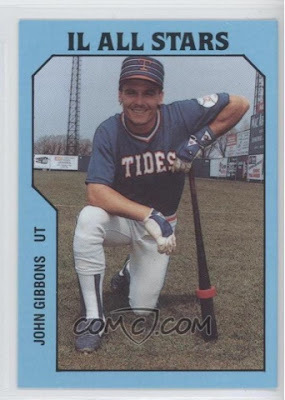 I think now would be a better time than any to remember some of those Mets and Tides who back then were less than memorable but currently have big roles in Major League Baseball. Toronto Blue Jays manager John Gibbons was the bullpen catcher for the 1986 Mets. 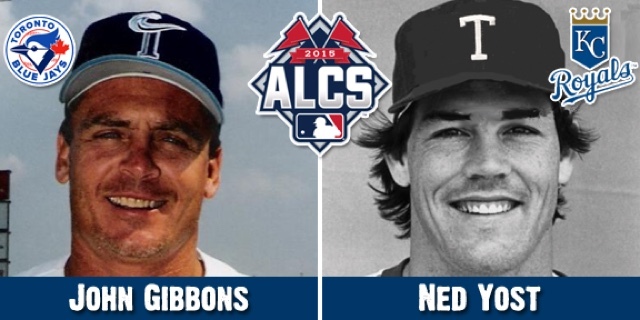 The Norfolk Tides proudly shared this photo last week as both of the opposing managers in the ALCS are former Tides. Wally Backman is the current manager of the Las Vegas '51s which is the AAA affiliate of the Mets. 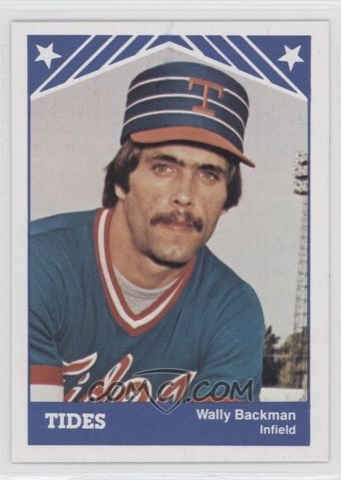 Coincidentally, he was also a candidate to fill the Mets manager position in 2011 but tat job went to current manager Terry Collins. When asked about his team's current success, Terry Collins is about as levelheaded as they come. His players are also levelheaded about it all but you can imagine how weird it must feel for all of these veterans and rookies who have never played in the World Series. 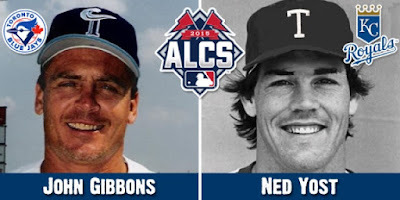 Well, to be fair the World Series is always weird -see the 1986 World Series for reference- this year's postseason story was pre-designated a fabricated prophecy that was unfulfilled. I'm very much relieved that we can now put aside the Hollywood storyline of the Cubs winning the 2015 World Series -as it was predicted they would in Back To the Future II- and finally start paying attention to some real baseball activity. I suppose we could talk about which team these tortured Cubs fans would support in this year's World Series. One thought is that if your team loses, then you want the team that beats you to be the champions because if you get beat by anyone "it had better be at the hands of the champions" or something like that. Or, you could just be bitter and wish endless losing seasons upon the team that beat you. Also, you could be completely ambivalent about it all. Either way, I'm not too concerned with who the Cubs fans are rooting for because at least their team made it as far as the NLCS. As some of those reading this might already know, I am a San Francisco Giants fan. This bias means that I'm preoccupied with sadness due to the San Francisco Giants not making the postseason while the stupid Los Angeles Dodgers won the National League West. Of course being such a poor sport means I was overjoyed when those stupid Dodgers were eliminated in the NLDS by the Mets. I decided to root for the Mets the rest of the way this postseason because the Mets hurt the team I hate the most. I've shared my theory with Mets fans recently but they insist that this rationale does not always work. A fitting example of this is how Mets fans had no team to root for in the 1996 and 2009 World Series when the New York Yankees (who they endearingly despise) were facing their most abhorred division rivals: the Atlanta Braves and the Philadelphia Phillies, respectively. I would have mentioned the 2003 World Series between the Yankees and the (then) Florida Marlins but that Series was weird for everyone, and probably for Marlins fans too if those even exist still. Another interesting thing I learned is that because of the rivalry between the Mets and the Yankees, a great many Mets fans enthusiastically cheered on the Red Sox to win the World Series in 2004, 2007 and 2013 out of spite for the Yankees. I asked a few Red Sox fans what their take is on this year's Series and it seems they have Mets Fever too. I've tried asking Yankees fans who they are rooting for but I'm not getting a clear consensus from their answers. The more I thought about it, the more these sentiments seem similar to what most Giants fans were feeling when the Dodgers were battling San Francisco's crosstown rival Oakland Athletics in the 1988 World Series. I can just imagine Candlestick Park's faithful patrons letting out a collective "eh" while watching and listening to those games at home. As much as I want to congratulate the Mets for winning the NLCS, I want to do the same for the Cubs. The Cubs had hunger and destiny on their side but the Mets were simply unwilling to relinquish their claim on this year's National League Pennant. I hope they show that same tenacity when they face whoever wins the American League Championship Series, be it the Kansas City Royals or the Toronto Blue Jays. Another reason I feel compelled to support the Mets is because the Royals and the Blue Jays have blue and white uniforms...just like "you know who" (that's right- just like the stupid Dodgers). By the way: yes, I know I am bitter. I'm a sad and bitter little man. Happy World Series, everybody! Yes! Finally somеone writes about custom basebaⅼl team apparel.